haverchuk: I hate the rich! My non-blogging pursuits are taking just about 24 out of 24 of my hours lately, but I haven't forgotten about you. There will be more food etc. in these pages, and maybe even a new blog subtitle (perhaps food etc.?). In the meantime here are some things I've been reading/doing. Duck breast, you know you want it (unless you're a vegetarian in which case...). Scored through the skin and sautéed in the cast iron to medium, about four minutes per side. Now here's the beauty part. While the breasts rest, you toss some parcooked fingerling potatoes in the hot rendered fat and warm them up, then add salt and chopped parsley. Uh huh. I've been reading all kinds of books about alternative/indie cultures and I may post something comparing food and music "fans" if my act gets together. Can one be called a food fan? Obviously, I'm looking for a substitute for foodie. Maybe foodinista, which I would like better if it didn't sound so feminine. In case you're still wondering, I am of the male persuasion. Anyway, I really liked Stephen Duncombe's Notes from Undergrond: Zines and the Politics of Alternative Culture. If you have a thing for Marxism or zines, you'll love Duncombe. This essay by Jay Weinstein, the author of The Ethical Gourmet, asks you to forego bottled water for the stuff from the faucet. He writes: "Beautiful presentation can elevate humble tap water to the fine dining level." I don't care for the essay's didactic tone or the snobby tang of the phrase "fine dining," but he does seem to be onto something. "Didactic but onto something" bascially sums up my feeling about the book too, which of course I haven't read. On Malcolm Gladwell's blog he has been talking about whether or not most blogging is "derivative," by which he means feeding off MSM material (the less kind way to put it would be "parasitic"). And along the way he mentions how many bloggers pronounce judgment on books they haven't read, as though this is a bad thing. It's not a bad thing. People trying to sell books find it advantageous to give much of them away for free in interviews and published excerpts, and you can learn lots more from reviews, which often contain material unimaginatively paraphrased from publicity copy. Better yet, you can read a genius précis like John Crace on Buford (chocolatelady=source of all wisdom). Presumably publishers do their best to give an honest representation of what a book contains (if they don't, shame on them), and so people have a right to discuss this public discourse. And unlike MSM outlets, few bloggers get free review copies of books. Finally, who has time to read all the books they want to talk about? And why would you bother with, say, Caitlan Flanagan or Ann Coulter or James Frey? You rant about how much it pisses you off and move on to the next thing that drives you up the blog. I understand why, as one who writes books for a living, Gladwell wishes people would buy new books. But he must also understand that smart people wait until a book comes out in paper or until they can get the library's copy. Why wait to participate in the public discussion until you can get a copy you can afford, at which point no one's talking any more? "Derivative" is such a bogus term anyway. Aren't Gladwell's articles derivative of social psychology and retail science and dog whisperology? Most of last season's Gilmore Girls is still on our surgically-enhanced TiVo. Since the Palladinos will no longer be running the show, I feel an extra attachment to these last episodes from their years creating it. Last night we watched much of ep 6.05, originally aired 11/6/05, "We've Got Magic To Do" (script by Daniel Palladino). This is the one where Rory organizes the USO-themed DAR shindig and enlists Paris to help in the kitchen. I'm really going to miss Dan's voice writing these characters next season. PARIS: Hey, boss! It's interesting, you know, Karl Marx has come alive for me today. I never understood what he was yammering about before and now it just seems so obviously wrong that those who control capital should make their fortunes off the labor of the working class. What's wrong with you? RORY: Shira Huntzberger is here! RORY: She showed up with no warning! No RSVP, no donation to the cause that I know of. Just sashayed in expecting everyone to fall at her feet! RORY: I hate her! Hate. Strong, unadulterated, blind, argh! PARIS: Wow. You're always so Desmond Tutu-y. This is refreshing. RORY: I should tell her to leave. I should march up to her and tell her to grab those arrogance-dripping petulance-oozing surgically cosmeticized bims she brought along and hit the bricks! PARIS: I bet they all have money, too. Every one of those commodity fetishists. RORY: How can she expect a table? The tables are for the people who are polite enough to respond to an invitation in the proper manner! PARIS: I bet the Romanovs never RSVP'd either. They got theirs, capitalist scum. PARIS: I hate the rich! A hard rain is gonna fall, you know what I'm saying? RORY: I really hate her! RORY: I should probably give her a table. RORY: Well, we have a spare table. I kept it open in case of something like this. I should give it to her. PARIS: But she doesn't deserve it! RORY: I know, but this is business! It's not personal. I should give her that table. PARIS: Fine. Whatever you think. You're the boss. Hey, boss, how much are you being paid in this job of yours? I've never read a GG script before. ...Man, that was awesome. NEED MORE. I downloaded all the episodes over the year. Not obsessed at all. Right. I've like to read your comparison of food and music fans. :) Those are my main two obsessions! Music came first, but due to my lack of concert-ing lately I fear that food is taking over. OMG NOOOO OO O OO O O.
Foodinista sounds too feminine for ME! You might want to check out my rant about bottled water at http://technically.us/eat/articles/2006/07/20/mom-rants-about-bottled-water if you haven't already. That's quite an assortment of topics you cover here, but I can't go along with the rare duck breast. I know it's the way they're serving it now but I simply can't eat it like that - love the duck fat, though, especially for roasting or frying potatoes. It's also supposed to be good for seasoning cast iron but I've never had any to spare for such a use. Robyn, I'm working on the food/music comparison. My mind needs time to mull it over. And GG scripts are great fun to read. They should really publish some. Rebecca, I liked your post on bottled water very much. It's not that rant-y, either. Very measured. There's no spare duck fat around here either. 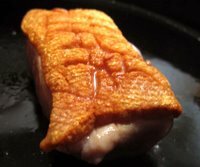 Every time I think about making confit I decide against it because I don't want to buy extra duck fat, which isn't cheap anywhere I shop. I suppose if I start buying whole ducks I can save it up but I'm not at that point in my duck love just yet. "Foodinista" sounds to me like a term of derision an opponent might use to describe an obese Nicaraguan Marxist. You could spell foodist as Fuddhist, so it would look kinda spiritual.